The Tax Cuts and Jobs Act contains many major changes to the tax landscape that will affect every type of business entity, both large and small. The new tax reform creates significant opportunities to minimize a business’s overall tax burden. Perhaps the most impactful—and favorable—legislation to the real estate industry is the changes and modifications to depreciation rules. 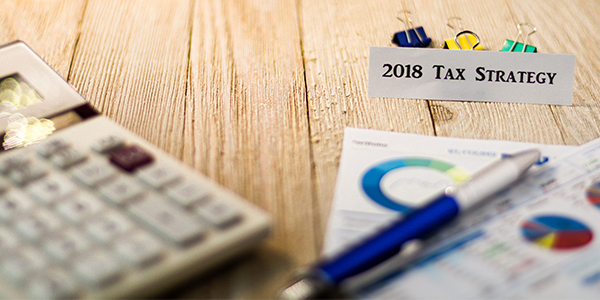 Here we highlight key components that impact the commercial real estate industry and provide a comparison between the current and new tax laws. Under prior tax law, most assets held in rental real property were required to be depreciated over periods typically ranging from 5-39 years. Assets with 20-year class lives or less were normally eligible for 50% bonus depreciation, which means we could deduct 50% of the asset in the first year and depreciate the rest over the remaining life of the asset. Under the new law, those same assets are now eligible for a 100% deduction in the year placed in service. Congress has also expanded bonus depreciation to acquisitions, which were not eligible in years past. This is a huge benefit for real estate in many ways, as it allows for significant tax write-offs in the first year for acquisitions, new developments, and redevelopments. At Stirling Properties, we contract out a cost segregation study on all of our new acquisitions, developments, and redevelopments. These studies allocate the purchase price of the asset into its proper class life. The resulting history allows us to estimate what depreciation will look like on the project during underwriting. On the front end of our due diligence, we have an accurate idea of how much of the purchase price is going to be eligible for the new 100% bonus depreciation. For a $60 million acquisition or development, we estimate that as much as 20% of that investment can be expensed in year one, resulting in over $11 million in depreciation. 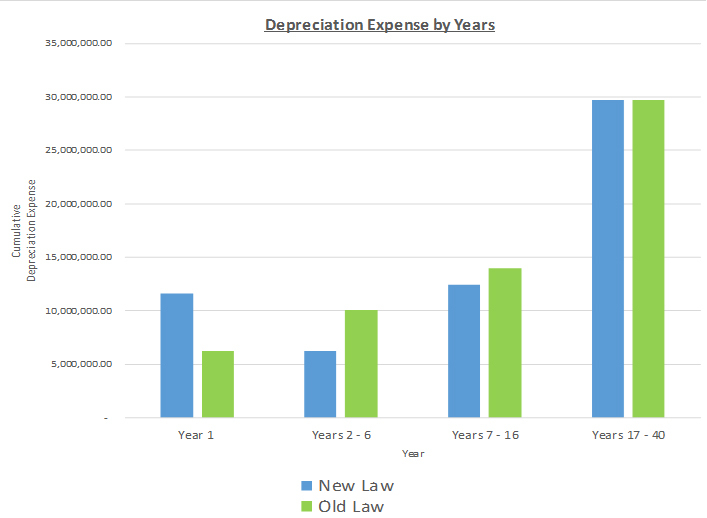 As you can see in the chart below, depreciation expense has approximately doubled in year one as compared to the old law. The net present value (NPV) of the tax savings resulting from being able to deduct the additional depreciation in year one is over $500,000. Similarly, ongoing operations of the property will be impacted considerably. To attract and retain high-quality tenants, landlords typically provide tenant improvement allowances which result in enhancements to the occupant’s space that revert to the landlord upon lease expiration. Under the prior law, these tenant improvement allowances were typically eligible for 50% bonus depreciation and the balance depreciated over 15 years. Under the new law, these allowances will be eligible for a 100% deduction in the year placed in service. Investing in real estate can be a tax advantageous way to deploy capital, especially for individuals or companies that have significant recurring income tax burdens such as financial institutions. We anticipate that the new tax law will lead to higher demand for quality assets helping to keep deal flow robust, thus attracting more buyers and investors into the real estate arena. At Stirling Properties, we will continue to utilize this new tax law for the best interest of our properties and investors. Disclaimer: The information contained herein is intended for information purposes only. Individuals should seek advice directly from a qualified professional before making any decisions or taking any action that might affect your personal finances or your business. Stirling Properties is not responsible for any investment or monetary decisions made based on the information provided above and is not a tax advisor. The information provided above was done so with the perceived intent of the legislation and not based on the actual regulations. The actual regulations could yield significantly different results.